IBM® InfoSphere™ Classic Federation Server for z/OS® provides integration of non-relational z/OS data with distributed tools and applications through SQL-driven access to z/OS data sources. 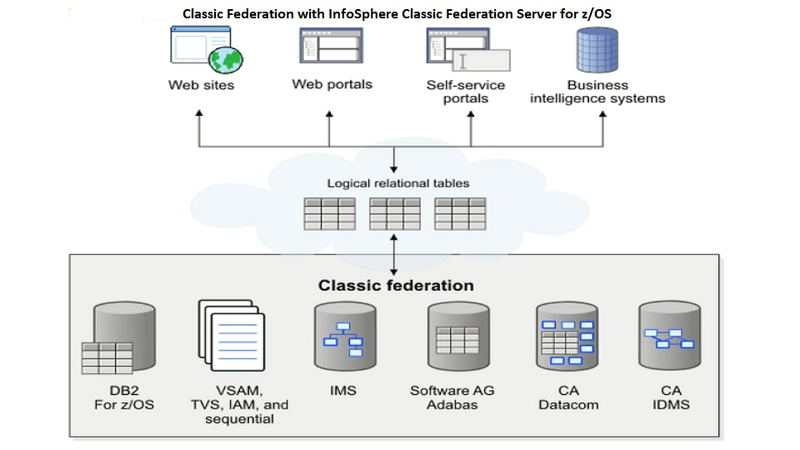 Classic Federation Server can be used to deliver operational data to customer self-service environments, connect ecommerce sites with current mainframe order processing data and integrate business intelligence systems with enterprise data. Classic Federation Server for z/OS is a companion product to InfoSphere Information Server, an innovative platform that helps extract more value from complex, heterogeneous information spread across various systems. Metadata mapping enables the servers operational components to efficiently navigate databases and files. Dynamic metadata discovery helps to accelerate implementation. Subcomponents read and write from legacy sources using native I/O commands to maximize the native performance of mainframe data sources. This helps minimize errors and ensure database integrity. Designed for enterprise workloads, Classic Federation Server accesses mainframe data at transaction speed so that Web sites can service high volumes of transactional and user demands. Classic Federation Server requires no mainframe programming and no legacy database skills. Developers using their existing SQL development, reporting and portal tools are productive immediately.